When Simon Rustage bought a £10 Mega Rich scratchcard from the Bridge Lane Store in Appleton, Warrington, while travelling back home from a visit to his father, he immediately scratched it. Imagine his surprise when the ticket revealed he had won something, which he and the shop assistant deemed to be £250,000. 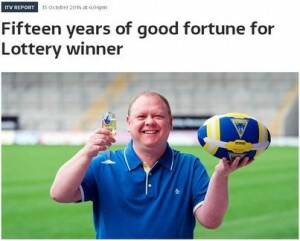 The bigger surprise came when he went to the lottery offices to claim the prize and discovered he had not won £250,000 after all; he had actually won a prize that pays out £250,000 for the next fifteen years. Despite his big win Rustage still plans to keep on working, although he has made plans to buy a new car and a season ticket for Warrington Wolves Rugby team, among others.